For the first Store Feature Friday of March we present Mylk Guys! They are a 100% vegan online specialty store that ships right to your door. Here's Mylk Guys! WHAT IS YOUR TEAM MISSION? Mylk Guys is on a mission to make it absurdly easy to be vegan. Mylk Guys is truly your vegan happy place. We carry some of the largest brands in the country and also lots of amazing small brands you've probably never heard of. Our goal is to bring you the best of everything vegan and get it to your door as quickly as possible, no matter where you live, so that you can continue practicing a lifestyle that is better for the animals and for the planet. WHY DO YOU CARRY AMAZI? When we first learned about Amazi, we were inspired by the company's mission to produce clean snacks that provide employment opportunities and economic growth to rural communities. One of the most compelling reasons to go vegan is to stop causing harm to our planet and its inhabitants (animals and humans alike), and we love that Amazi is not only avoiding causing harm but is actually using the food system for good in this world. It was also love at first bite when we tried their amazing plantain chips and chews! If you're in the San Fran area, be sure to check them out for some delicious vegan snacks and Amazi of course! We're back at it again with the Store Feature Friday! This week we are highlighting Rasa Juice Shop. RASA is dedicated to support local businesses, cruelty-free products and provide sustainable lifestyle opportunities via food, juice, wellness events, and coaching. Read on to learn more about their amazing shop! RASA's mission is to provide sustainable lifestyle opportunities for the community and local clients and customers in Baltimore, DC and Annapolis. We are the only exclusive vegan and gluten-free juice shop in Annapolis, using organic produce and ingredients. We prioritize cruelty-free and sustainable options in food, juice, wellness events as well as coaching. Lisa, the founder, is also an Integrative Nutrition Health Coach so she is there to help with the unique needs of each customer. Amazi is an amazing product that is aligned with our mission- to support and carry women-owned products that give back. Our customers are excited to have healthy options for snacks that fuel the body. This week, we are highlighting Import News! Import News a globally focused print and snack shop. They carry independent publications from communities and individual creatives around the world, plus fun and intriguing stuff to eat. Import News tries to capture some of the spirit of traveling. When you're away from home, you're more willing to explore and try new things. We wanted to create that spirit in a low-key, comfortable space that's also a resource for our local communities. We carry Amazi because it's really tasty! It's also hard to find healthy snacks, so it's a really exciting to be able to offer plantain chips that aren't fried and yummy jackfruit chews. If you're in the NY or LA area, make sure to stop by Import News for some good reads and snacks, and Amazi of course! Swarthmore CO-OP is community-owned food market with open membership offering local produce, meat, dairy & more.Read on to find out more on their mission and operations! The Swarthmore CO-OP is a community-owned food cooperative with a brick & mortar market that’s open to everyone. Over 1,800 households within our community help financially support the CO-OP and allow us to bring locally farmed food options to your table, educate your children about sustainable farming, feed local families in need and host fun community-based events. 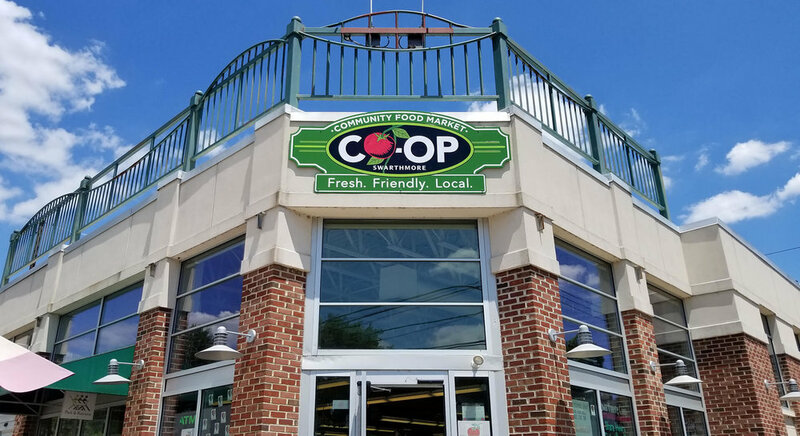 The Delco Times recently named the Swarthmore CO-OP the best local market in the area. We enjoy carrying products that support our mission. Vendors that are mindful of their products, and care about where they come from also stand out to us. Plus, who doesn't love a woman owned company?! If you're in the Philly area supporting their store helps support the local economy and businesses, and Amazi too!